I was working in inDesign the other day when I needed to use Spell Check on my work, yet didn’t know where to find it. Rather than hunting aimlessly through the menu structure, I went to the Help menu to type in my search. Using the Help menu is an action I rarely do; I usually know what I’m looking for or don’t trust the application to give me a straight answer. A reasonable reaction, I think. After all, Cooper says that Help menus are more often created poorly and historically known to not be very helpful. So from a usability standpoint, the Help menu not only helps users find what they’re looking for, but also shows them where it is by highlighting it and providing a blue arrow that moves slightly to catch your attention. Cooper states that Help menus should aid the user in understanding the program, and I would certainly say that this does a good job of that. This article reported that only few designers religiously follow design guidelines. For this reason, the authors evaluated the extent that designers are able to use such guidelines to offer new improvements in clarity and efficiency. By developing the guidelines further, it would help improve accuracy and present information in a way that makes them more usable. However, refinement doesn’t mean that designers would necessarily use them in their interface design processes. Three interface designers were given a set of 87 guidelines in which they marked any difficulties or terms they found unclear. Later, they were observed during a study in which they were to identify and redesign problems using a whiteboard, but were encouraged to use the guidelines. At first they were not obligated to follow them, but were asked to think aloud their reasoning. Afterwards, they were told to change the new interface by applying all the guidelines one by one. 91% of guidelines resulted in errors with at least one designer, however only 11% of the guidelines were actually violated by their new design. The authors found that the designers tended to misinterpret the guidelines and mainly focus on prior designer experience. Examples the paper provided show lack of clarity for conditions and nature of guidelines and difficulties with certain terms. As a designer the results were not surprising. Personally, I often rely on past experiences rather than the clarity of guidelines. I also think that guidelines are just that– guidelines: encouraged to be followed but you should know when they can and should be broken. The difficulties the designers had were also relatable. For example, reading about the design process for class and applying them later in class is a completely different matter. I often find myself not knowing how to effectively apply a process until experiencing it firsthand. I would say that clarifying guidelines is a good proactive and should be done, but this study revealed that following them isn’t completely necessary to make an exceptional design. Hipmunk is a travel start-up much like Travelocity or Kayak, however it focuses much more on data visualization. From the get-go, users are introduced to a large, simple interface. After inputting details on your trip, you get to see your results in a colorful, organized timeline that allows you to visualize a lot if data at once. I would say this differs from the many travel sites that give you text-based results. Hipmunk allows for a lot of options while remaining visually appealing. Not only can you sort by different options such as prince, duration, arrival, but you can narrow your search down to specific airlines, start a parallel search on the same page, and talk to live help, if available. Aside from the functionality of the site, there are several principles that help this succeed. 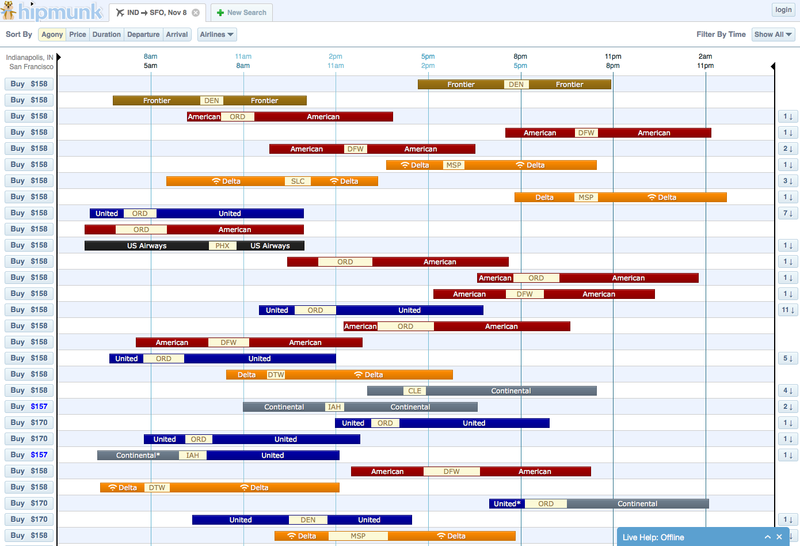 For one, the obvious use of a grid helps align this information to give users a better sense of the timeline. The menu is also well done and simplified, where drop downs are for secondary functions that might not be used right away. Certain data is also noticeably clickable (buttons) as they give the affordance of being pushed.